The Hideaway cabin is equipped with a kitchenette, dining area, 1 bedroom and 1 bathroom. The open living area offers plenty of room to relax. The Hideaway Cabin can be combined with the lower cabin, The Valley View, via a secured stairwell, sleeping a total of 6 people. Art and Amy are gracious and sweet hosts for a relaxing getaway - so helpful and pleasant. They are happy to get you anything you need to make your stay the best in the area! You'll be back year after year to see them, they will become your friends! If you are looking for a hideaway to rest and relax in , this is the place! Very clean, home- like cabins with everything you need! If you want to cook your daily catch, it's all there. If you want award winning cuisine, it's less than 10 minutes to the best eating around! Shopping opportunities for all tastes- moments down the scenic drive. Morning coffee on your private deck with the best nature has to offer - we'll be back to get another tail waggin' welcome from the resident greeters Hazel and Barney! Easy to contact and quick response. Friendly and helpful. We enjoyed our stay very much. Clean and comfortable. Nice to be close to both Beaver Lake and Eureka Springs. This property is under new management who were a very pleasant surprise. We loved the warm greeting and eagerness to be of assistance during our stay. Our stay at the White River Cabins, was awesome. We were scuba diving at Beaver Lake damn site just a few minutes away. 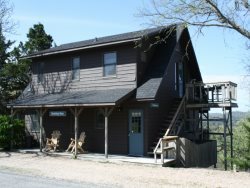 The White River Cabins are very conveniently located to Eureka Springs, Roaring River fish hatchery and Rogers Arkansas. The staff at the White River Cabins were very helpful and made our stay even more enjoyable. Thank you. Amy and Art were simply put, amazing. They felt more like your next door neighbors than the actual owners of the property. They were extremely helpful during our stay, and we will definitely be back with friends & family! Excellent views, and great patio decks for morning coffee while looking down on the White river. Very, very happy with our stay there! We love these cabins! They feel like a home away from home! The views are amazing and so relaxing! We are already planning our next stay!